They're The First Black Africans To Ride In The Tour De France : Goats and Soda The two men are from Eritrea. They're rising (and climbing) stars. And they're changing the image of the bike in Africa, where it's often looked down on as a poor person's transportation. Eritrea's Daniel Teklehaimanot competes in a 13.8 km individual time trial, the first stage of the 102nd edition of the Tour de France cycling race, on July 4 in Utrecht, The Netherlands. Few places are as rich in cycling lore as the Col du Tourmalet, the brutal 6,939-foot pass in the French Pyrenees that has been a mainstay of the Tour de France since 1910. This is where history is written and legends are made. Eugene Christophe, for example, famously broke the fork on his bike in the 1913 Tour de France but, rather than quit, jogged 6 miles down the mountain carrying his bike on his shoulder until he found a blacksmith's shop in the village of Sainte-Marie-de-Campan. He fired up the forge, repaired the damage himself, filled his pockets with bread from the local bakery and rode on, still managing to finish in seventh place when the race concluded in Paris two weeks later. As the peloton snaked its way over the Col du Tourmalet this afternoon, on the 188-kilometer stage between Pau and Cauterets-Vallée de Saint-Savin, two equally indomitable riders were writing themselves, their country, even their continent, into the rich history of Le Tour. 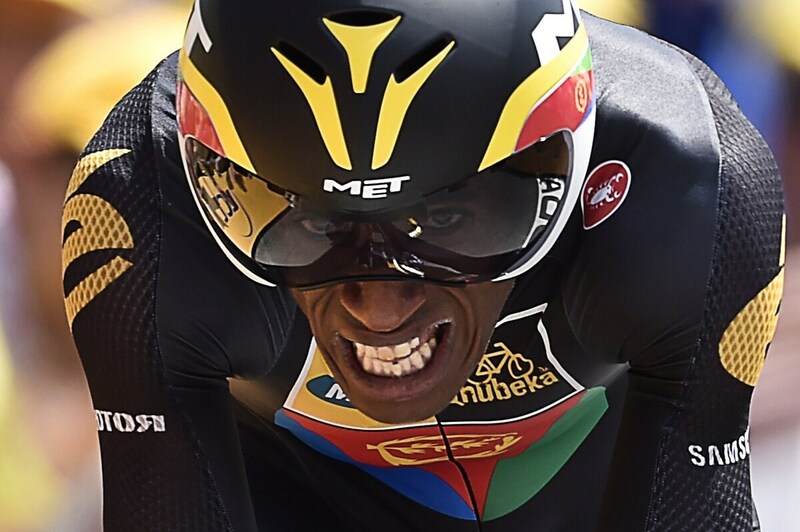 Eritrean riders Daniel Teklehaimanot and Merhawi Kudus are not only the first black Africans to compete in the tour but are also racing for the first-ever African-registered team to compete in the race, the South Africa-based MTN-Qhubeka. Although Africans have been competing at world-class levels for decades in distance running, poor roads and the high cost of racing bicycles were barriers to the sport of cycling. And there was a social stigma to riding a bicycle as well. "There is a perception in Africa that if you own a bike it means you're too poor to own a car," says Douglas Ryder, the founder of MTN-Qhubeka. "So you'd rather walk." In Eritrea, however, because of its Italian connections from colonial days, cycling — at least racing — had a certain cachet. Teklehaimanot grew up watching the Tour de France and fantasizing about riding in the peloton one day. He was talent-spotted by officials at the International Cycling Union in 2009 and sent to Europe to learn to ride like a pro. After stints with a Canadian team and an Australian team, he signed on with the African-based MTN-Qhubeka and found himself in the peloton at the Tour de France, this afternoon pedaling up the iconic Col du Tourmalet in the wake of all the great names of cycling he heard as a child. Neither he nor Kudus is there to fill out the field. Until yesterday Teklehaimanot held the iconic polka-dot King of the Mountains jersey — awarded to the best climber in the field — while Kudus, at 21 the youngest rider at this year's tour, already has significant palmares — the cycling term for wins, places and accomplishments — earned in races in Rwanda, Malaysia and Spain. Already the two have acquired a fan base; a smattering of red-blue-and-green Eritrean flags have been seen fluttering among the crowds lining the course (although Eritrea's government has come in for criticism in articles about the race). Their team, MTN-Qhubeka, presently in fifth place in the team classification, hopes this year's race will be just the beginning and that Africa will turn out to be as dominant in cycling as it is in long-distance running. Certainly the talent is there, according to Nairobi-born-and-raised English rider Chris Froome, the current race leader and 2013 winner of the Tour de France. "I believe riders from East Africa are potentially the best endurance athletes in the world," he said in an interview with the Mail & Guardian Africa last Saturday. "At the moment the biggest problem they are struggling with is infrastructure, roads to train on and equipment." Noting some of the cycling initiatives that have started up around Africa, he said: "I don't think it will be too long before we see some real results coming out of East Africa." To that end, Teklehaimanot's team, MTN-Qhubeka, is working with a global nonprofit organization called World Bicycle Relief to raise funds to buy and distribute 5,000 bicycles to African schoolchildren as part of a campaign called Bicycles Change Lives. Qhubeka — which means "to carry on" in the Nguni language — hopes it will not only usher in a wave of talented new African riders in the peloton but also make cycling a cool form of transport back home.